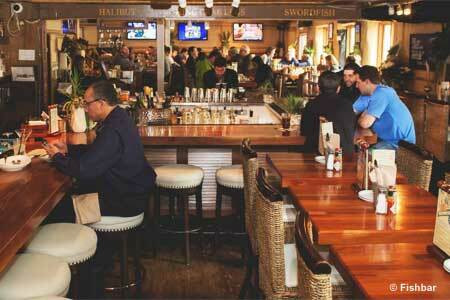 A New England seafood house with a sports bar scene in Manhattan Beach. : This ode to the New England seafood house has a bar and seating at booths and tables. Televisions line the walls and feature different sports on each screen. Fresh oysters on the half shell make a nice starter in warm Manhattan Beach weather. We also like the classic iceberg wedge with blue cheese and the signature clam chowder --- thick and creamy but not heavy, with a hint of spice. A handful of sandwiches and fish tacos are available, but the seafood entrées, especially those from the mesquite grill, are the way to go. Mahi mahi, trout or salmon can be served with a secret seasoning or blackened. French toast bread pudding for dessert is as rich as one would expect, similar in texture to a cinnamon roll. Most of the wines by the glass are full-bodied California Chardonnays and Cabernet Sauvignons, and thus not the best to pair with seafood, so we recommend opting for one of the craft beers or Bloody Mary. Weekly specials include Taco Tuesday, Wine & Crab Wednesday and Lobster Thursday. 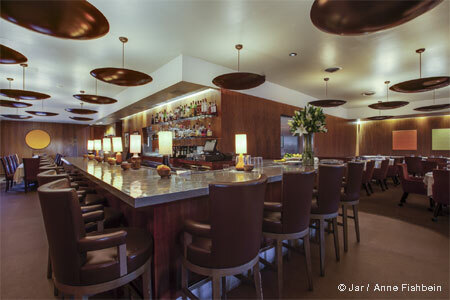 There’s also happy hour Mon.-Fri. from 2:30 p.m.-5:30 p.m.